Can we compare different cultural forms of life? I’ve been reading and commenting on a book that has little to do with the range of subject matters usually covered here at Footnotes to Plato: C. Kavin Rowe’s One True Life: The Stoics and Early Christians as Rival Traditions (if you are interested in my ongoing commentary over at How to Be a Stoic, check part I, part II; and part III; there will be one more, forthcoming soon). The reason I’m bringing this up here is because of Rowe’s chapter 8, entitled “Can we compare?” His goal is to eventually show that Stoicism and Christianity are fundamentally incompatible ways of life, with distinct — and incommensurable — internal logics. I don’t think so, but that’s another story. What’s interesting here is that Rowe deploys the influential philosophy of Alasdair MacIntyre to lay the grounds for his conclusion, and MacIntyre’s philosophy is very much relevant to ongoing discussions about, say, science vs pseudoscience, or atheism vs religion, and a number of other dichotomous positions that we often approach with the assumption that we can meaningfully compare and decide which is more rational or rationally defensible. 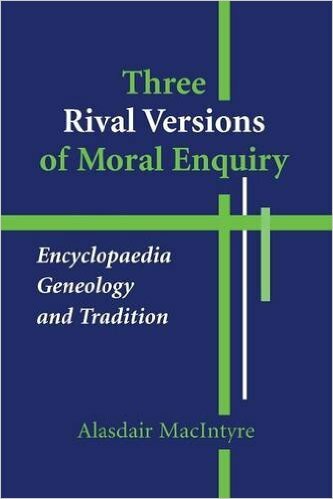 MacIntyre distinguishes among three forms of inquiry that have shaped the way we think about pretty much anything from a scholarly perspective: he calls them encyclopedia, genealogy, and tradition. He further argues that if we adopt one mode of inquiry then the other two are precluded, because the three are mutually incommensurable. The encyclopedia mode of inquiry takes the name from the encyclopedists of the Enlightenment, who were committed to the notion of a single, unitary rationality. Much of modern science is still built around that tradition, and so is the approach of the so-called skeptic community when it deals with pseudoscience, or of science-inclined atheists when they dismiss religious belief. The encyclopedist, moreover, is committed to the idea of progress by way of reason, which allows him to judge the past according to modern standards, and therefore also to talk of “primitive” notions in other cultures. As Rowe puts it, quoting MacIntyre: “Truth is thus ‘what it is independent of standpoint [and] can be discovered or confirmed by any adequately intelligent person, no matter what his point of view.” A corollary of this, apparently, is that there is nothing beyond the limits of human understanding (though I would consider the latter an example of scientistic faith, not something that stems directly from the encyclopedist approach). MacIntyre makes the provocative statement that the encyclopedist approach has been “defeated” and that it is now reduced to a form of “fideism” (which is pretty strong wording considering that much of academia, and certainly all of the natural sciences, seem not to have noticed such utter failure). Why does he think this? Because by now we should know that there is no point of view from nowhere, not even in science, and that reason means different things in different contexts, that distinct starting axioms lead to entirely internally consistent, and yet utterly incompatible, perspectives and conclusions about what the world is like and how to best navigate it. If we grant that to be the case, for the sake of argument, what are the alternatives? The first is what MacIntyre calls genealogy. Rowe writes: “Where the encyclopedist presupposed unitary rationality, a unified world, and progress toward truth itself, Nietzsche, the original genealogist, saw no such things … Cosmopolitanism, the genealogist argues, is an illusion: we can only take sides in the warring of various rivals,” and, of course, “reason” simply covers up the intention of particular groups to acquire or maintain power, usually by oppressing other groups. Moreover, when we do take sides, we don’t do it for rationally defensible reasons, we just do it because it is inevitable, for a human being, to feel like he belongs to one or another group. Second, “like a craft in which every way to do it is not as good as every other, a tradition of inquiry has norms of and for rational success that have emerged through history as the tradition has come to identify excellence in its particular way of inquiry.” This is a crucial point, because it positions traditions right in between encyclopedia and genealogies: in the encyclopedic approach, there is only one rational way to do things; in the genealogical approach there is no such thing as a rational way, only a variety of ways, or “stances”; in the traditional approach there are a number of rationally, self-consistent, but mutually exclusive, ways of doing things. The analogy with a craft is really apt, so I wish to stress it. Imagine understanding, say, Renaissance painting from within each of the three ways of doing inquiry. The encyclopedist would say that there is only one true way of doing painting (let’s say the one that adopts the new technique of perspective as laid out in Leon Battista Alberti’s De Pictura), and that everyone else is simply mistaken about the subject. The genealogist would argue that all painting schools are fundamentally the same, and assertions that one is better than the other are just more or less transparent grabs for power. The traditionalist, however, would say that there are distinct ways of painting, and that each can be practiced and appreciated only within the particular school that originated it. For the traditionalist, it makes no sense to compare across schools (like the encyclopedist would), but it does make sense to analyze the style and techniques within a given school in terms of their quality (which the genealogist wouldn’t do). Keep this summary in mind because I will return to the analogy again at the end, when discussing my own take on the subject. An important third characteristic of traditions is that “learning the skills that make a tradition of inquiry cannot simply be done with ‘the mind.’ Rather, for a tradition in MacIntyre’s sense, the skill of rational inquiry requires a transformation of the person in a much broader sense.” Think, again, of a Renaissance shop: if you want to learn how to paint or sculpt, you join Domenico Ghirlandaio‘s workshop (like Michelangelo did, for instance) and learn from him and his students, you don’t just sit down and read a book about it. So much for MacIntyre’s classification of the three fundamental approaches to inquiry. Let me briefly explain the connection of all this to Stoicism and Christianity as a specific example, but then zoom back out to points of more general interest for the readership of Footnotes. In comparing Stoicism and Christianity, the encyclopedist would begin with the assumption that there is a rational way to describe and compare the two philosophies, eventually to determine which one is “better.” The genealogist would simply say that whatever arguments either the Stoics or the Christians advance on behalf of their way of thinking is no better than the other, and at any rate such arguments are put forth in the service of exercising power over the other community. The traditionalist, by contrast, would put forth that to really understand the internal logic of either philosophy one has to adopt it as a way of life, and that since we can only live one life, we have to make what MacIntyre calls a “pre-rational” choice and stick with it. Now for my take on this whole thing, which remember I see applicable to a much wider set of discussions than the specific one in which Rowe brings it up. When I was younger and more naive (and a practicing scientist) I was an encyclopedist. Everyone who is enamored of the Enlightenment ought to be. I am guessing that most scientists would nod vigorously to convey enthusiastic approval. But the encyclopedist approach is, indeed, naive. Human knowledge can never have the luxury of adopting a view from nowhere, and there are different ways of doing science, for instance. Biologists work in different ways from physicists, and both of them very differently from social scientists. They use different assumptions as well as conceptual and methodological tools, and there is no sense in which one science is “better” than the other (pace the physicists, who for centuries have presented their approach as the model to follow). There is, of course, no such thing as the scientific method, but rather a varied toolboxes, mixing instruments from logic, mathematics, statistics, observational and experimental methods in a very pragmatic fashion. There is most certainly not one way (let alone the best way) of doing philosophy, as I’ve argued at length in the online book I published last year on the subject of the nature of philosophical inquiry. There are many ways of doing mathematics, both in terms of which axioms one accepts or rejects (compare Euclidean with spherical geometry, for instance) and of the methods employed (by analytical proof or by computer simulation, so-called “experimental” mathematics). And there are many logics, again each characterized by particular axioms and procedural rules: from classical Aristotelian to many-to-infinite-valued logic, from paraconsistent to deontic logic, and so forth. And again, in all of the above, it doesn’t make any sense to compare and judge: paraconsistent logic isn’t “better” than multivalued logic. They are simply useful for different things. The same goes for Euclidean vs spherical geometry, and even more so for analytic vs continental, or “Western” vs “Eastern” philosophy. That said, I certainly don’t go for the Nietzscheian-Foucaultian genealogical approach. Madness certainly is, in some respects, a social construction, and it has indeed been used as an instrument of power. Moreover, the same applies to science in general (e.g., eugenics). But there really are mentally disturbed human beings, who really do benefit from certain treatments to improve their condition. Similarly, it may well be that analytical and continental philosophers make power grabs within academia, for instance in terms of number of tenure track positions, and scientists of different disciplines (or persuasions within a given discipline: like string theorists and their critics) do it to an even larger extent because they usually have some serious money at stake. But this does not negate that there is genuinely good (and bad) philosophy and science that are produced by those groups and intellectual currents. That leaves us with the third approach from MacIntyre’s menu, that of “traditions.” Here I am sympathetic, but not entirely convinced. Going back to the analogy with a Renaissance workshop, it is indeed true that even academic disciplines, like the sciences and philosophy, work that way. If you wish to become a scientist nowadays you enter graduate school under the sponsorship of a particular mentor. You learn your trade not very differently from the way in which Michelangelo learned his from Ghirlandaio. And when you become a professional, if you are lucky, you set up your own “shop” with your own assistants (postdocs, graduate students, undergrads), and so on. But there is a problem with the strict separation of different traditions advocated by MacIntyre, and that’s, I think, where his system needs some significant tweaking. While it is true that there are a number of rational and coherent ways of approaching a given type of inquiry — be it choosing a philosophy of life or adopting a scientific or philosophical research program — it is manifestly not true that no inter-approach comparison can ever be made, nor is it true that some judgment of relative quality or utility is somehow precluded a priori. Take, for instance, Rowe’s contrast between Stoicism and Christianity as “forms of life,” that is, philosophies that one adopts “pre-rationally.” Well, maybe the two are in fact incommensurable and equally good in some respect, but they both certainly beat hands down a number of other forms of life, for example Nazism. Why? because Nazism begins with assumptions (about the existence and superiority of a particular “race”) that are manifestly, empirically, false. It also leads to consequences (tyranny, war, genocide) that are equally obviously bad for human flourishing, which is the very point of a philosophy of life. So one can rationally (not pre-rationally) exclude Nazism from the range of viable philosophies to pursue, without needing a lifetime of practice and membership in the Nazi party before arriving at that conclusion. Similarly, while I don’t think there is a way to tell which “tradition” is better between, say, analytic vs continental philosophy, or historical vs experimental sciences, or one type of logic or math and another, there clearly are very good ways to tell bad philosophy, bad or pseudo-science, bad logic and bad math from the varieties that work. To recap, then: the genealogical approach is to be rejected because — despite its valuable reminder that human interactions are more often than not about power grabs — it quickly leads to relativism and/or nihilism. The Enlightenment/encyclopedic approach is naive and carries the nasty consequence of undermining a genuine and fruitful respect for different ways of doing inquiry. The tradition approach is best, so long as we understand that comparisons — and judgments of quality — across traditions are sometimes (but not always!) possible and in fact desirable. This entry was posted in Epistemology, Metaphilosophy on January 9, 2017 by Massimo. Actually, don’t answer. I don’t think I could bear the ensuing conversation. Second, Hume was less constrained by his culture than most, but nobody can entirely escape his culture. That said, I agreed before that it is a good thing to remind ourselves that even great thinkers of the past had their issues, and not just in ethics. Newton, for instance, believed in alchemy and was more interested in Biblical exegesis than in physics. From a modern standpoint, he believed in a lot of pseudoscience; moreover he believed in stuff that Seneca would have rejected more than 1500 years earlier. So? But as Dan says, the current trend seems to be mostly about signaling, and it does have potentially dire consequences on university and even high school curricula. None of what either Dan or I have written can reasonably be construed as implying that racism and sexism don’t matter. As for the idea that some people should have known better. Sure, one can say that (though, again, just wait a few centuries and see the sort of horrible things people will say about our moral standards… Oh, right, we won’t be there to benefit from their criticism!). Your comment about the gene pool was entirely irrelevant, and a discussion of it would not be complicated at all. I know what you are getting at, but unless that has anything to do with somehow justifying slavery (which would be silly and pernicious) it is, as I said, irrelevant.